The Regular Season in NBA G League just ended. The fans could enjoy quite many interesting games in the last day. The day ended with change at the leadership position, favorites losing the games and games ending by tiny margin. Here is the last day review presented by ESL. Twenty third defeat of league's leader Windy City Bulls (27-23) against fourth ranked Canton Charge (22-28) 120-109 was the most important game of the last day. Canton Charge shot the lights out from three sinking 13 long-distance shots on high 54.2 percentage. They looked well-organized offensively handing out 34 assists. It was a good game for guard Levi Randolph (196-92, college: Alabama) who led his team to a victory with 36 points (!!!) and 4 assists. Forward JaCorey Williams (203-94, college: Middle Tenn.St.) contributed with 31 points and 7 rebounds for the winners. Guard Walter Lemon-Jr (190-92, college: Bradley) replied with 32 points, 9 rebounds and 9 assists for Windy City Bulls. Canton Charge maintains fourth position with 22-28 record. Windy City Bulls lost third consecutive game. They dropped to the second place with 23 games lost. They share the position with Salt Lake City S.. They were replaced at the leadership position by Santa Cruz W.. The game had a very big importance for second-ranked Drive as it allowed them to take a leadership position after previous leader's (Windy City Bulls) loss. Drive edged 3rd ranked Fort Wayne Mad Ants in Grand Rapids 121-118. It ended at the same time the two-game winning streak of Fort Wayne Mad Ants. Guard Isaiah Whitehead (191-95, college: Seton Hall) scored 31 points and 6 rebounds to lead the charge for the winners and Kalin Lucas chipped in 22 points and 6 rebounds (went 12 for 12 at the free throw line !!!) during the contest. The best for the losing side was forward Alize Johnson (206-96, college: Missouri St.) with a double-double by scoring 34 points (!!!) and 11 rebounds. Both coaches used bench players in such tough game. As mentioned above they are at the top of the standings, which they share with Memphis H. Fort Wayne Mad Ants at the other side keep the third place with 27 games lost. Third-ranked Clippers (26-23) used its home court advantage to challenge first ranked Warriors (33-16) in Ontario on Saturday. The visitors from Bismarck managed to secure only two-point victory 112-110. However their fans expected easier game. Darius Morris notched 26 points, 8 rebounds and 4 assists to lead the effort. Warriors' coach used a ten-player rotation in such tough game. Even 22 points, 9 rebounds and 5 assists by Johnathan Motley did not help to save the game for Clippers. Warriors have a solid three-game winning streak. They maintain first position with 33-16 record. Loser Clippers keep the third place with 23 games lost. Fifth-ranked Herd (12-38) used its home court advantage to challenge first ranked Long Island Nets (34-16) in Oshkosh. The visitors from Uniondale managed to secure only one-point victory 126-125. However their fans expected much easier game. The best player for the winners was Dzanan Musa who scored 27 points, 7 rebounds and 6 assists. Both coaches tested many bench players in such tough game. Long Island Nets have a solid three-game winning streak. They maintain first position with 34-16 record, which they share with OKC Blue and Rio Grande VV. Herd lost fourth consecutive game. They keep the fifth place with 38 games lost. Important game to mention about took place in Westchester. Fourth ranked Erie Bay Hawks (24-26) saved a 1-point victory on the road edging one of their biggest challengers Knicks (29-21) 123-122 on Saturday evening. It was a good game for Jordan Sibert who saved his team from a defeat with a double-double by scoring 31 points and 10 rebounds. Erie Bay Hawks have a solid four-game winning streak. They moved-up to third place, which they share with Greensboro S. and Sioux Falls S. Loser Knicks dropped to the second position with 21 games lost. There were no big surprises in other games of day 126: Lakeland M. beat Raptors 905 on the road 118-104. Austin S. was destroyed by OKC Blue on its own court 107-138. Delaware BC managed to outperform Maine RC in Newark, Delaware 124-117. Capital City Go-Go managed to beat Stockton K. at home 128-123. NAZ Suns defeated South Bay L. on the opponent's court 99-96. Texas L. was beaten by Greensboro S. in a home game 97-107. Rio Grande VV won against Sioux Falls S. on the road 105-99. The most impressive performance of 126th day was 22 points, 14 rebounds and 6 blocks by Isaiah Armwood of Capital City Go-Go. The game between closely ranked teams ended with first ranked Magic's (32-18) road victory over second-best Raptors 905 (29-21) in Mississauga 118-104 on Saturday. Magic made 16-of-21 free shots (76.2 percent) during the game. They looked well-organized offensively handing out 25 assists. It was a good game for guard Jeremiah Hill (188-95, college: Valdosta St.) who led his team to a victory with 22 points, 9 rebounds and 8 assists. Swingman B.J. Johnson (201-95, college: La Salle) contributed with 34 points (!!!) for the winners. Hill is a former Eurobasket Summer League player, which is considered top international summer league in the market. 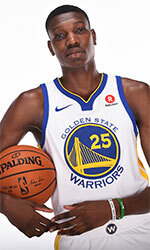 Canadian-Saint Lucian power forward Chris Boucher (208-93, college: Oregon) replied with a double-double by scoring 26 points and 11 rebounds and guard Jordan Loyd (193-93, college: Indianapolis) added 16 points, 5 rebounds and 13 assists in the effort for Raptors 905. Five Raptors 905 players scored in double figures. Both coaches allowed to play bench players saving starting five for next games. Magic have a solid four-game winning streak. They maintain first position with 32-18 record. 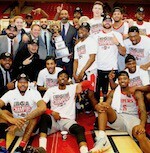 Raptors 905 lost third consecutive game. Defending champion keeps the second place with 21 games lost. Rather expected game when 3rd ranked Austin Toros (20-30) were smashed at home by first ranked OKC Blue (34-16) 138-107 on Saturday. OKC Blue forced 20 Austin Toros turnovers. They shot the lights out from three sinking 19 long-distance shots on high 54.3 percentage. OKC Blue looked well-organized offensively handing out 28 assists. Austin Toros were plagued by 25 personal fouls down the stretch. It was a good game for forward Donte Grantham (203-95, college: Clemson) who led his team to a victory with a double-double by scoring 21 points and 10 rebounds. Forward Kevin Hervey (206-96, college: Texas Arlington) contributed with a double-double by scoring 22 points and 10 rebounds for the winners. Ghanian center Amida Brimah (213-94, college: Connecticut) replied with 21 points, 8 rebounds and 6 blocks (on 9-of-11 shooting from the field) and Puerto Rican-American swingman John Holland (195-88, college: Boston U.) added 20 points and 4 assists in the effort for Austin Toros. Both teams had five players each who scored in double figures. The winner was already known earlier in the game, so both coaches allowed to play the bench players saving starting five for next games. OKC Blue have a solid four-game winning streak. They maintain first position with 34-16 record, which they share with Long Island N. and Rio Grande VV. Loser Austin Toros keep the third place with 30 games lost. Third-ranked Clippers (26-23) used its home court advantage to challenge first ranked Warriors (33-16) in Ontario on Saturday. The visitors from Bismarck managed to secure only two-point victory 112-110. However their fans expected easier game. Warriors looked well-organized offensively handing out 21 assists. Great defensive blocking was one of the keys in this match when Warriors made 10 blocks. Guard Darius Morris (193-91, college: Michigan) notched 26 points, 8 rebounds and 4 assists to lead the effort and guard Kendrick Nunn (190-95, college: Oakland, agency: Pensack Sports) supported him with 30 points. Warriors' coach used a ten-player rotation in such tough game. Even 22 points, 9 rebounds and 5 assists by forward Johnathan Motley (206-95, college: Baylor) did not help to save the game for Clippers. Dominican forward Angel Delgado (206-94, college: Seton Hall) added 18 points and 15 rebounds. Both teams had four players each who scored in double figures. Warriors have a solid three-game winning streak. They maintain first position with 33-16 record. Loser Clippers keep the third place with 23 games lost. We could consider it a predictable result in the game between close teams when fifth ranked Blue Coats (21-29) won against one of their biggest challengers Maine Red Claws (19-31) in Portland 124-117 on Saturday. Blue Coats made 20-of-26 free shots (76.9 percent) during the game, while Maine Red Claws only scored four points from the stripe. Blue Coats looked well-organized offensively handing out 24 assists. It was a good game for guard Shake Milton (198-96, college: SMU) who led his team to a victory with 25 points. Australian power forward Jonah Bolden (208-96, college: UCLA) contributed with a double-double by scoring 17 points and 12 rebounds for the winners. Thomas Robinson (208-91, college: Kansas) replied with a double-double by scoring 34 points (!!!) and 11 rebounds and forward Nick King (201-95, college: Middle Tenn.St.) added 19 points, 7 rebounds and 6 assists in the effort for Maine Red Claws. Five Blue Coats and four Maine Red Claws players scored in double figures. Blue Coats moved-up to fourth place. Maine Red Claws lost fifth consecutive game. They dropped to the fifth position with 31 games lost. NBA G League day 126 caused change at the leadership position. Twenty third defeat of league's leader Windy City Bulls (27-23) against fourth ranked Canton Charge (22-28) 120-109 was the most important game of the last day. Canton Charge shot the lights out from three sinking 13 long-distance shots on high 54.2 percentage. They looked well-organized offensively handing out 34 assists. It was a good game for guard Levi Randolph (196-92, college: Alabama) who led his team to a victory with 36 points (!!!) and 4 assists. Forward JaCorey Williams (203-94, college: Middle Tenn.St.) contributed with 31 points and 7 rebounds for the winners. Guard Walter Lemon-Jr (190-92, college: Bradley) replied with 32 points, 9 rebounds and 9 assists and forward JaKarr Sampson (206-93, college: St.John's) added 24 points, 12 rebounds and 5 assists in the effort for Windy City Bulls. Five Canton Charge and four Windy City Bulls players scored in double figures. Canton Charge maintains fourth position with 22-28 record. Windy City Bulls lost third consecutive game. They dropped to the second place with 23 games lost. They share the position with Salt Lake City S.. They were replaced at the leadership position by Santa Cruz W.. The game had a very big importance for second-ranked Drive as it allowed them to take a leadership position after previous leader's (Windy City Bulls) loss. Drive edged 3rd ranked Fort Wayne Mad Ants in Grand Rapids 121-118. It ended at the same time the two-game winning streak of Fort Wayne Mad Ants. Drive made 32-of-38 charity shots (84.2 percent) during the game, while Fort Wayne Mad Ants only scored fourteen points from the stripe. Drive players were unselfish on offense dishing 21 assists. Fort Wayne Mad Ants were plagued by 27 personal fouls down the stretch. Guard Isaiah Whitehead (191-95, college: Seton Hall) scored 31 points and 6 rebounds to lead the charge for the winners and point guard Kalin Lucas (185-89, college: Michigan St.) chipped in 22 points and 6 rebounds (went 12 for 12 at the free throw line !!!) during the contest. The best for the losing side was forward Alize Johnson (206-96, college: Missouri St.) with a double-double by scoring 34 points (!!!) and 11 rebounds and guard Rob Gray (185-94, college: Houston) scored 22 points, 7 rebounds and 6 assists. Four Drive and five Fort Wayne Mad Ants players scored in double figures. Both coaches used bench players in such tough game. As mentioned above they are at the top of the standings, which they share with Memphis H. Fort Wayne Mad Ants at the other side keep the third place with 27 games lost. Important game to mention about took place in Westchester. Fourth ranked Erie Bay Hawks (24-26) saved a 1-point victory on the road edging one of their biggest challengers Knicks (29-21) 123-122 on Saturday evening. Erie Bay Hawks made 25-of-31 free shots (80.6 percent) during the game. Erie Bay Hawks had a 51-40 advantage in offensive rebounds. Great defensive blocking was one of the keys in this match when Erie Bay Hawks made 7 blocks. Knicks were plagued by 24 personal fouls down the stretch. It was a good game for guard Jordan Sibert (193-92, college: Dayton) who saved his team from a defeat with a double-double by scoring 31 points and 10 rebounds. Point guard Anthony Barber (188-94, college: NC State) contributed with 32 points and 5 assists for the winners. Center Jameel Warney (203-94, college: Stony Brook) replied with a double-double by scoring 26 points and 11 rebounds and guard Billy Garrett (198-94, college: DePaul) added 25 points and 6 assists in the effort for Knicks. Both teams had five players each who scored in double figures. Erie Bay Hawks have a solid four-game winning streak. They moved-up to third place, which they share with Greensboro S. and Sioux Falls S. Loser Knicks dropped to the second position with 21 games lost. Fifth-ranked Herd (12-38) used its home court advantage to challenge first ranked Long Island Nets (34-16) in Oshkosh. The visitors from Uniondale managed to secure only one-point victory 126-125. However their fans expected much easier game. Long Island Nets made 22-of-26 charity shots (84.6 percent) during the game. Long Island Nets had a 44-31 advantage in offensive rebounds. Their players were unselfish on offense dishing 25 assists. The best player for the winners was Bosnian Dzanan Musa (200-99, agency: BeoBasket) who scored 27 points, 7 rebounds and 6 assists. Center Alan Williams (203-93, college: UCSB) chipped in a double-double by scoring 17 points and 15 rebounds. At the other side the best for losing team was guard Xavier Munford (188-92, college: Rhode Island) who recorded 31 points, 6 assists and 4 steals and guard Michael Qualls (197-94, college: Arkansas) added 22 points and 7 rebounds respectively. Both teams had five players each who scored in double figures. Both coaches tested many bench players in such tough game. Long Island Nets have a solid three-game winning streak. They maintain first position with 34-16 record, which they share with OKC Blue and Rio Grande VV. Herd lost fourth consecutive game. They keep the fifth place with 38 games lost. There was a minor upset when their close opponent Kings (30-19) lost to second ranked Capital City Go-Go (24-25) in Washington 123-128 on Saturday. Capital City Go-Go made 27-of-31 free shots (87.1 percent) during the game. Capital City Go-Go outrebounded Kings 57-35 including a 44-23 advantage in defensive rebounds. Great defensive blocking was one of the keys in this match when Capital City Go-Go made 7 blocks. Kings were plagued by 24 personal fouls down the stretch. It was a good game for forward Isaiah Armwood (206-90, college: G.Washington) who led his team to a victory with a double-double by scoring 22 points, 14 rebounds and 6 blocks. Guard Noah Allen (201-95, college: Hawaii) contributed with a double-double by scoring 19 points and 14 rebounds for the winners. Troy Williams (201-94, college: Indiana) replied with 37 points (!!!) and 5 rebounds and guard Cody Demps (193-93, college: Sacramento St.) added 16 points, 5 rebounds and 12 assists in the effort for Kings. Five Capital City Go-Go and four Kings players scored in double figures. Newly promoted Capital City Go-Go maintains second position with 24-25 record having five points less than leader Santa Cruz W. which they share with defeated Kings. Loser Kings keep the second place with 19 games lost. We could consider it a predictable result in the game between close teams when fifth ranked Northern Arizona Suns (11-38) edged one of their biggest challengers Lakers (21-28) in Los Angeles 99-96 on Saturday. Northern Arizona Suns looked well-organized offensively handing out 29 assists. It was a good game for Sudanese-American guard Peter Jok (198-94, college: Iowa) who led his team to a victory with a double-double by scoring 20 points, 14 rebounds and 5 assists. Forward Aaron Epps (208-96, college: LSU) contributed with a double-double by scoring 23 points and 10 rebounds for the winners. Five Northern Arizona Suns players scored in double figures. Guard Andre Ingram (191-85, college: American) replied with 19 points and 7 rebounds and forward Justin Harper (208-89, college: Richmond) added 20 points and 6 rebounds in the effort for Lakers. Lakers' coach rotated ten players in this game, but that didn't help. Northern Arizona Suns maintains fifth position with 11-38 record. Loser Lakers keep the fourth place with 28 games lost. The game between closely ranked teams ended with one of their biggest challengers Texas Legends' (16-34) home loss to third ranked Greensboro Swarm (24-26) in Frisco 97-107 on Saturday. Greensboro Swarm looked well-organized offensively handing out 32 assists. It was a good game for power forward Chinanu Onuaku (208-96, college: Louisville) who led his team to a victory with a double-double by scoring 19 points, 18 rebounds and 5 assists. Guard JP Macura (196-95, college: Xavier) contributed with 26 points and 7 rebounds for the winners. Canadian guard Xavier Rathan-Mayes (193-94, college: Florida St.) replied with a double-double by scoring 22 points, 10 rebounds and 7 assists and swingman Xavier Johnson (201-93, college: Colorado) added 20 points, 8 rebounds and 5 assists in the effort for Texas Legends. Greensboro Swarm maintains third position with 24-26 record having four points less than leader Santa Cruz W., which they share with Erie Bay H. and Sioux Falls S. Loser Texas Legends keep the fourth place with 34 games lost. No shocking result in a game when first ranked Rio Grande Valley Vipers (34-16) beat on the road 3rd ranked Sioux Falls Skyforce (24-26) 105-99 on Saturday. Rio Grande Valley Vipers forced 21 Sioux Falls Skyforce turnovers. They looked well-organized offensively handing out 24 assists. It was a good game for guard Michael Frazier (193-94, college: Florida) who led his team to a victory with 25 points and 7 rebounds. Forward Gary Clark (201-94, college: Cincinnati) contributed with a double-double by scoring 13 points, 11 rebounds, 4 assists and 4 steals for the winners. Rio Grande Valley Vipers' coach used entire bench which allowed the starters a little rest for the next games. Burkinabe-American guard Bubu Palo (185-91, college: Iowa St.) replied with a double-double by scoring 21 points, 5 rebounds and 11 assists (went 8 for 8 at the free throw line) and forward Emanuel Terry (206-95, college: Lincoln Memorial) added 20 points and 10 rebounds in the effort for Sioux Falls Skyforce. Five Rio Grande Valley Vipers and four Sioux Falls Skyforce players scored in double figures. Rio Grande Valley Vipers maintains first position with 34-16 record, which they share with Long Island N. and OKC Blue. Loser Sioux Falls Skyforce keeps the third place with 26 games lost.